The Snack that Smiles Back: When it comes to Goldfish crackers, you can feel good about serving your favorite snacks. All of our cheese varieties, like cheddar, are baked with real cheese, and Goldfish crackers are made with no artificial preservatives or flavors. This 30 oz. carton is also available in Cheddar Goldfish crackers, Xtra Cheddar Flavor Blasted Goldfish crackers, and Baked with Whole Grain Cheddar Goldfish crackers - made with 12g of whole grain per serving. Everyone loves Goldfish crackers - they're tasty and fun! With a large 30 oz. carton you can always come back for more, or have enough to feed a crowd. Do not purchase if carton is open or torn. 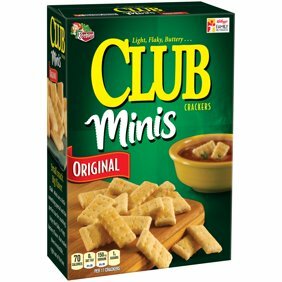 Ingredients: Made With Smiles And Enriched Wheat Flour (Flour, Niacin, Reduced Iron, Thiamine Mononitrate, Riboflavin, Folic Acid), Cheddar Cheese (Cultured Milk, Salt, Enzymes), Canola And/Or Sunflower Oils, Contains 2 Percent Or Less Of: Salt, Yeast, Autolyzed Yeast, Sugar, Spices, Celery, Onion Powder , Monocalcium Phosphate, Baking Soda, Colors (Annatto Extract, Beet Juice Concentrate, Paprika, Turmeric Extract, Huito Juice Concentrate, Watermelon Juice Concentrate). Contains: Wheat, Milk. Fresh and Fast! 1 week to get my box of goodies from walmart.com all the way to Afhanistan! I love the Free Ship to Home. Thanks Walmart! I've told all my comrades about the free and fast shipping, tax free delivery! I love gold fish! I was buying for a Vacation Bible School, so I needed 15 30 ounce boxes of Goldfish. I shopped around everywhere (brick and mortar stores as well as online). Walmart had the best price, by quite a margin, and with the numbers I wanted the price difference continued to multiply. I also paid no shipping costs, so the savings just continued. My kids absolutely love these. I place these crackers in a glass jar that looks like a fish bowl and they look so cute and appetizing. Everyone in my house loves goldfish. we go through a box of these every two weeks. These are a very cheesy flavorful taste. They are the perfect mix of cheese and crunch. I appreciate the value pricing on this product. In what aisle did you find these in? 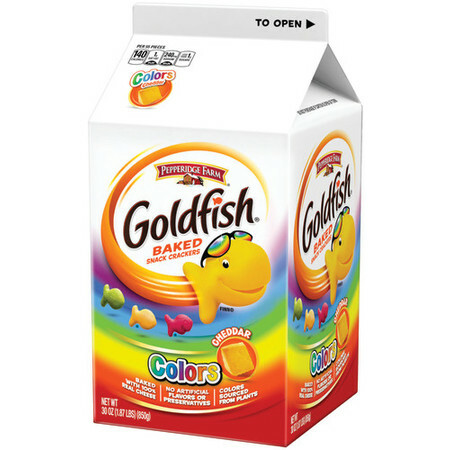 What exact colors are the goldfish? 1. Our Goldfish Colors Cheddar Crackers get their coloring from plants, such as beet and watermelon juice concentrates and annatto. Our colors include: orange, green, red, and yellow.